When planning your greenhouse design, the details concerning the exterior are often carefully orchestrated with decisions about the frame, the type of glazing, the shape and size etc. However, with regards to the interior greenhouse design, little attention is devoted to the proper and most efficient layout plan. We often assume that there will be enough space in the greenhouse to grow the plants of our choice, but before we realize it, the greenhouse is full. The right interior layout of your greenhouse will include benches, shelving and accessories to maximize the growing space that is available. The first and most important consideration for staging the greenhouse is the potting bench. There are several great varieties on the market which range in size and elaboration. It is ideal to choose a potting bench that includes a sink, hanging space for tools, storage shelves and an ample work counter for potting and re-potting plants. This vital piece of equipment is usually placed strategically against a wall where there is access to plumbing and enough room for working comfortably in the greenhouse. The traditional greenhouse bench is available in various lengths and widths. This greenhouse bench has adjustable heights to fit in most areas. Multiple benches in different sizes, when combined can form a unique collage to display plants. 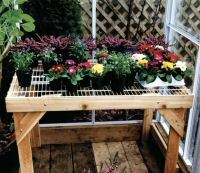 Tiered greenhouse benches allow extra space for low light plants that can be placed on the bottom shelves with the above plants protecting them from direct sunlight. Every greenhouse needs a seedling bed which is usually placed in the middle of the floor. The seedling bed is typically made from aluminum with a solid bottom containing the potting soil. The seedling bed imitates the outdoor garden and holds the most hardy plants and vegetables. The gravel bench is a larger version of an aluminum tray and is filled with gravel and water. Potted plants that require constant humidity such as orchids are placed on top of the gravel bench and are known to thrive in this setting. Greenhouse shelving can be mounted directly on the glazing bars allowing tall plants to grow underneath. Greenhouse shelves should be made of hard wood to avoid them from rotting due to the humidity. Plastic shelves can also be used but may not be able to hold as much weight as wood greenhouse shelving. Many people use white wire closet shelving in their greenhouse, which is another good option. With the extra space above the head, hanging planters can be added by suspending them from the ceiling. Hang an aluminum tube and you will have a fixture where multiple plants can be hung. Some greenhouses come with hooks for ceiling use. When planning and staging the interior of your greenhouse, place your fixtures and benches strategically to utilize the maximum space while at the same time, remembering to leave at least a three foot aisle way for easy movement.